Getting the job: STEP has a formal workshop to turn your teaching experience into a thoughtful teaching statement with supporting documents. Besides adding a line to my CV that says I’ve taught something and developed a course, it gave me a much better idea of what my future classes would look like so I could pass this on to my application readers. This really came through in the interviewing process; I was able to confidently say this is exactly how I would teach X topic or handle Y situation. 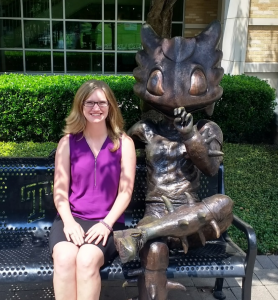 In addition, STEP provides you with a faculty mentor that can write a letter of recommendation that speaks to your teaching abilities—and Becca was abundantly helpful for advice when applying to a more teaching-centered position than my research mentors had experience with. In the end I was offered two tenure-track jobs at primarily undergraduate universities—I would have been happy at either, but it sure was nice to choose. Starting the job: When I started at Texas Christian University, I was tasked with developing a new course for the college: a one-semester biochemistry course for pre-health students. Without STEP I would have likely gone about this by begging slides from former mentors that taught two semester courses, tried to cut out half of them, and ended up with a very unsatisfying course for both me and the students. Instead, I used backwards design—learned in STEP—to come up with course learning goals, work from that to get individual class learning goals and use those to make activities to teach the students what they need to know anddevelop their critical thinking skills. It was a challenge, but because of STEP, it was one I tackled. Doing the job: Now I am 2.5 semesters into life on the tenure-track. One surprise has been that even after teaching for a year, I still think about my few weeks teaching in STEP as I reflect on what is working in my course and what changes I can make to improve it. The STEP debriefs after classes taught me how to evaluate my teaching and how to use quick in-class assessments of student learning to improve my course. It’s working, too. My students show dramatic improvements in their ability to explain concepts and evaluate complex biochemistry data. My faculty and student evaluations have been better than one would expect from a new course. And I continue to love teaching this course! Dr. Mikaela Stewart is an Assistant Professor of Biochemistry in the Biology Department of Texas Christian University. She studies protein function using approaches from biochemistry, structural biology, and biophysics. This entry was posted in Careers by STEP Admin. Bookmark the permalink.